Join us Nov. 10 at 6pm at the Olympia Center in downtown Olympia for this free talk by Christian Science lecturer Josh Niles from Boise, Idaho. 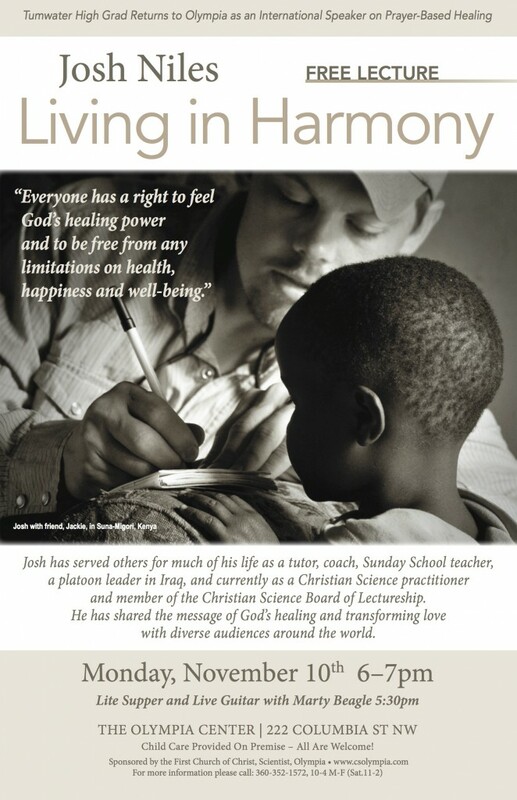 Josh has served others for much of his life as a tutor, coach, Sunday School teacher, a platoon leader in Iraq, and currently as a Christian Science practitioner and member of the Christian Science Board of Lectureship. He has shared the message of God’s healing and transforming love with diverse audiences around the world. Child Care provided On premise – all are Welcome! This entry was posted in Uncategorized and tagged harmony, Josh Niles, lecture. Bookmark the permalink.